For black text on whiteclick here to ZAP Colors! 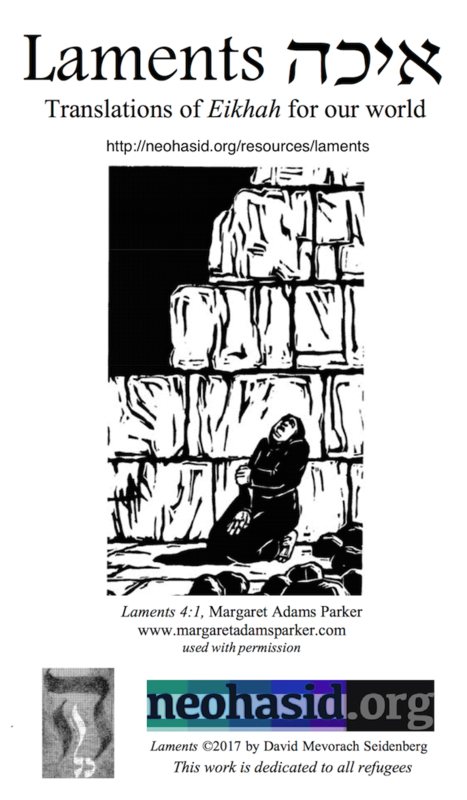 for more Tisha B'Av resources click here! You can fast, sit on the ground, etc., but you can't really observe Tish'a B'Av without feeling it. A good translation of Eikhah, "Lamentations" or "Laments", makes a huge difference. If you want to get what makes Tish'a B'Av real or relevant, try this translation. The current version can be downloaded in handout and booklet format. Copy it for your synagogue, havurah, minyan. Tish'a B'Av תשעה באב is not primarily about mourning, but about becoming refugees, being thrown into a hostile world without shelter or protection. Part of this experience is mourning for what has been lost, but what we think of as mourning customs -- not wearing fresh clothes, not washing, eating or drinking, not being able to sit down -- more closely resembles the experience of a refugee than a mourner sitting shiva. Tish'a B'Av is not primarily about the end of sacrifices or the Temple – Chaza"l, the rabbis, figured out how to live without the Temple long ago. Rather, it's about homelessness, fleeing from war into famine, about things that are all too present in our world. It's also an opportunity to confront the ways in which we as individuals (and as a people) use our power to make others (people and species) into refugees. In an era when refugees are mistreated, when children are separated from families in order to punish parents for seeking asylum in the U.S., when countries across eastern Europe as well as Italy have come out to meet people fleeing war with armed opposition, like Edom rising up to repel the Israelites, we need to read Laments as the story of what is happening right now. The following file of neohasid's translation of Eikhah can be printed back-to-back and folded in half to make a 28-page booklet (seven sheets double-sided). They can be stapled on the center crease.When you click to download, a window will open to make a donation -- but you do not need to donate in order to download the booklet. Please support neohasid with a donation! If you print out the booklet format on single-sided sheets, when you stack them for double-sided copying, the page numbers in the left hand corner would go like this: 1, 27, 3, 25, 5, 23, 7, 21, 9, 19, 11, 17, 13, 15. When copied back-to-back, the booklet should fold so that it opens like a Hebrew book. If your copier doesn't distinguish between book format and calendar format, you may need to turn every other page upside down. Make sure you've put the sheets in order correctly and that the page numbers are coming out right before you run more than one copy! The translation offered here is one of the best you'll find for liturgical use. Ten years in the making (and first conceived in 1993), Laments was finally completed in 2017, with chapter 3 fully retranslated, new artwork, and an expanded afterward. For 2018 a few minor tweaks to the translation have been made, and some additional commentary has been added at the end. Laments uses the Buber-Rosenzweig principles of concordant translation, which means it's closer to the Hebrew syntax and sense than the JPS. It strives to connect us on a gut-level to what Laments and Tish'a B'Av are all about: a national cataclysm that turned the entire people into refugees, treated with hostility by neighboring countries and persecuted by ruling powers. I always have at least one chapter read phrase by phrase in Hebrew and English when I lead a Tish'a B'Av reading, and it's always a very powerful experience. Laments also includes an afterword on theology and theodicy in Eikhah. Click here to read the afterward. Please consider making a donation if you use this offering of Eikhah and find it meaningful! $3 is appreciated; if you're making more than 10 copies, 50¢ per copy is appreciated. All funds will be used for neohasid.org. Thank you! Please share! Click here to download a handout format PDF that staples in the upper left-hand corner with pages in consecutive order (read each sheet right-to-left). When you click to download a window will open to make a donation. You can download Laments whether or not you donate. Playing a solea or siguiriya does it for me. Super Great Job! I love the layout and translation. Thanks. I've just added a post to my site with your Fresh Translation. Thanks to Kay Magilavy for inserting page numbers into the 2008 edition!